Richard's Page: Back to Normal? If "normal" is working on the Ural then things are back to normal. 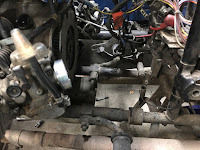 This evening, I pulled the transmission out leaving the engine in the frame. 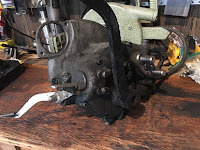 To do this, it's necessary to remove the final drive as well as removing the rear swingarm pivots. This allows the drive shaft to go back far enough to remove the rubber flexible coupling between the output of the transmission and the driveshaft. Definitely easier than removing the engine and it took about 1½ hours. Now, I need to figure out the minimum disassembly needed to crack open the transmission. 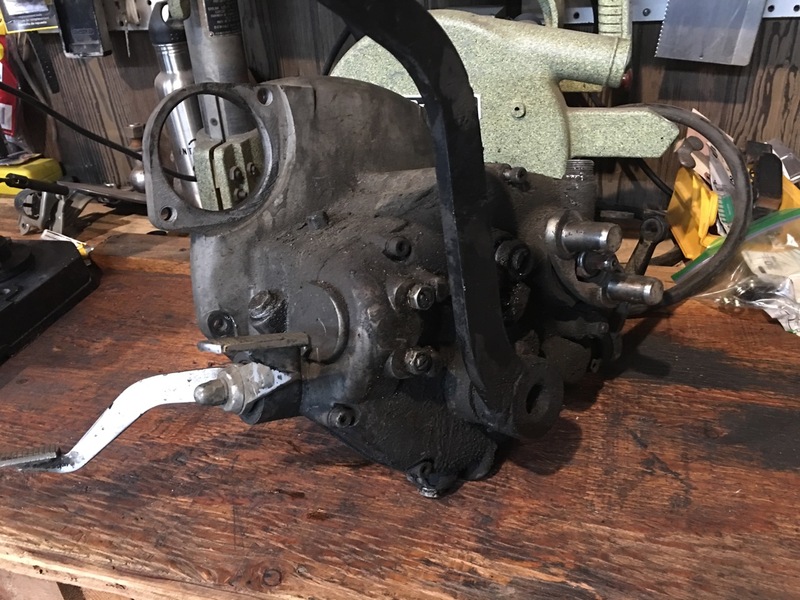 The Ural repair manual mentions some special tools but I'm thinking that they would only be needed if the transmission was going to be completely disassembled. I removed the kick start lever then the seven screws holding the case together. After a few light taps, the case separated. 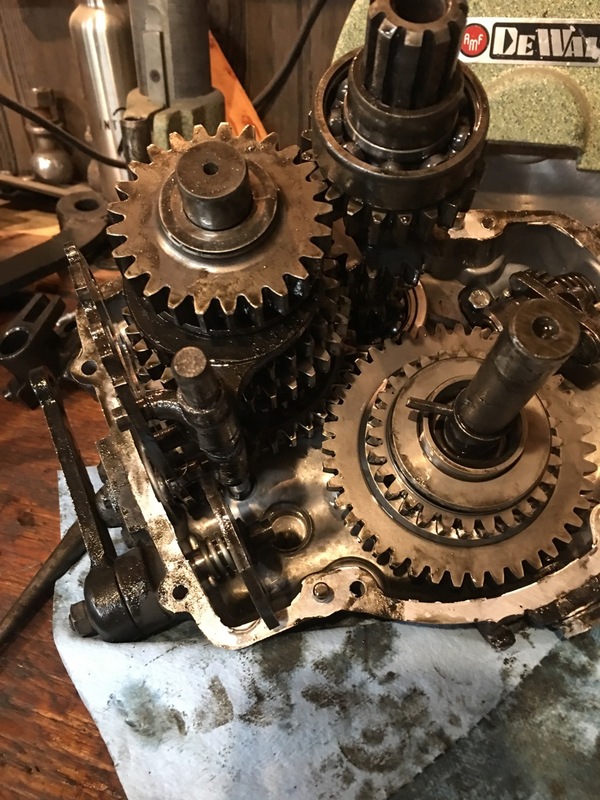 The picture on the right shows the inside of the gearbox after the reverse idler was removed. I am unable to remove the output yoke as there isn't enough room for even a very thin walled socket. It took me a bit to figure out which gear was which. In the picture on the right, 4th is the uppermost gear and 3rd is just below it. Right now, it is in 3rd gear and you can see that the shift fork is held in barely held in place. 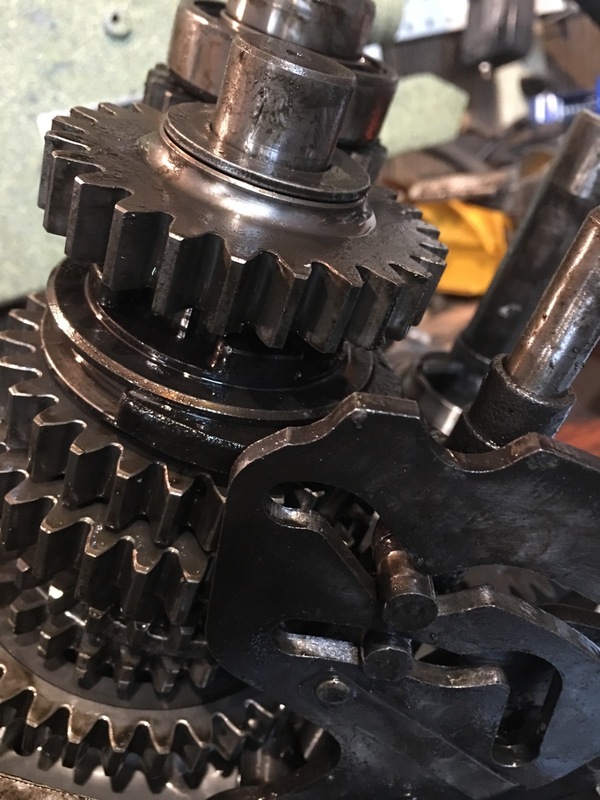 If there is any wear on the gear, the fork or the shift sleeve that engages the gears, then it could easily pop out of gear. Since it isn't going completely into 3rd, it seems that the shift fork is probably the worn part. There is a little bit of rounding of the edges on the sleeve and 3rd gear. More than any of the other gears. 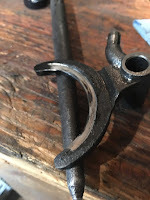 This is the 3rd gear side of the 3rd/4th shift fork and there seems to be a lot of wear and even some hot spots. Those are the discolored spots. I think that I am going to order the 3rd/4th shift fork, the 3rd/4th shift sleeve and 3rd gear. I think that the reason it isn't staying in gear is that the parts are just worn out. 3rd gear is used a lot. Just about any speed from 30mph to over 50 mph could be in 3rd gear. By the way, there was only a trace of metal on the drain plug magnet and the oil still looked pretty fresh. Whenever I start to think about a URAL I visit your blog Richard to recalibrate my brain. I bought a URAL t-shirt last week. Had been imagining all sorts of rides. Thanks so much for setting me straight on normal life with a URAL! It does have 55k km on it so some repair is expected. And I think that some of the accelerated wear may be from riding in colder than normal temperatures. I hadn't expected transmission issues as there is almost none mentioned in the forums. Especially with the change to the Austrian made gears. That looks like a fun, dirty mess you have there. Are the gears pressed on, or are they easily removable. When I went into Petunia's it was easy until the need to replace the pressed on gears and I wasn't willing to chance doing that myself. Baker was quick on the turnaround. I haven't tried removing 3rd gear itself but it looks like it's on a spline. Step 1 is to remove the input shaft from the bearing. Everyone that owns a Ural is a mechanic. At least that's what the sticker on my Ural say. "Ural. Making Motorcycle Mechanics Out of Ordinary People for the Past 75 years!" 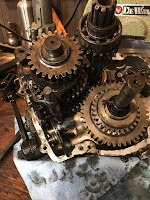 Correction, the words Spare Gearbox, would lead a reader to assume it was in working order. It wasn't, it had been swapped out by the dealer for another rider and he let me have it. I was wondering if you repaired the gearbox to have a spare on the shelf. The way the shift fork fits in the quadrant, 3rd gear is barely held in. In other words, it wouldn't take a lot of hear for it to pop in/out of gear like it was doing.